Should infants be baptized? Let’s consider what place children had in the Old Testament and what that says about children in the New. Should infants be baptized? The last blog-post gave the first part of the answer to that question. Though there’s no explicit command in the New Testament to baptize the children of believers, that article had said, there’s also no command in the New Testament prohibiting that the children of believers receive the sign of the covenant. And since the Author of the New Testament is the same as the author of the Old Testament, any change in practice would necessarily have to be stated expressly. Since such a command doesn’t exist, we ought to expect to find examples of infants being baptized in the New Testament…..
Ah ha, you say, that’s exactly the point: there are no examples of infants being baptized in the New Testament! Well, is that true? In this article I’d like to follow up on that left over item from the previous article. I’ll need to consider what place children had in the Old Testament and what that says about children in the New. Once we’ve wrapped our minds around that point, we can get to whether in fact there are examples of children being baptized in the New Testament. Today’s western society looks at persons primarily as individuals, and only secondarily as members of families. The Old Testament picture is different. In the days of Noah God determined to destroy all mankind, but left one exception: “Noah found favour in the eyes of the Lord” (Genesis 6:8). Yet once the ark was complete, the Lord instructed not just the single righteous individual Noah to “go into the ark”, but his “whole family” was to join him (Genesis 7:1). The phrase “your whole family” included Noah’s wife, his three sons, and their wives (7:13). Please note: because of the righteousness of the one man, God had mercy on his entire family. That pattern jumps into its own in God’s covenant with Abraham. God told him, “I will establish My covenant as an everlasting covenant between Me and you and your descendants after you for the generations to come, to be your God and the God of your descendants after you” (Genesis 17:7). God’s attention was not directed to the individual, but to the family represented in the person of Abraham. As a result, “on that very day Abraham took his son Ishmael and all those born in his household or bought with his money, every male in his household, and circumcised them, as God told him” (Genesis 17:23). “Every male in his household” included “the 318 trained men born in his household” with whom Abraham pursued the four kings who had captured his nephew Lot (Genesis 14). That these 318 were also circumcised was, the text says, “as God told him” – and the point is that with His covenant with Abraham God’s goodness touched all those whom He entrusted into Abraham’s care. The point is that God does not work with isolated individuals, but works in families. At Mt Sinai the Lord God renewed His covenant with Israel with these words, “I am the Lord your God, who brought you out of Egypt, out of the land of slavery” (Exodus 20:2). Yet what was the makeup of the people congregated at the foot of the mountain? Was the content of God’s word here valid only for the adults? Obviously not, for in this same conversation the Lord addressed specifically the children also; He told them in the fifth commandment to “honour your father and your mother” (vs 12). Here is the same point: God deals with His people in families! Carefully follow the terms of this covenant, so that you may prosper in everything you do. All of you are standing today in the presence of the LORD your God – your leaders and chief men, your elders and officials, and all the other men of Israel, together with your children and your wives, and the aliens living in your camps who chop your wood and carry your water. You are standing here in order to enter into a covenant with the LORD your God, a covenant the LORD is making with you this day and sealing with an oath, to confirm you this day as his people, that he may be your God as he promised you and as he swore to your fathers, Abraham, Isaac and Jacob. I am making this covenant, with its oath, not only with you who are standing here with us today in the presence of the LORD our God but also with those who are not here today (Deuteronomy 29:9-15). Notice that the children and the wives, and even the aliens in the camp, are included in the crowd of those with whom the Lord made His covenant. More, that covenant is made not only with those who were present “but also with those who are not here today.” That last phrase is not a reference to the mothers or children who stayed behind in the tent, for they were already included in the earlier reference to “your children and your wives”. That phrase is rather a reference to the children yet unborn, those of coming generations (see Acts 2:39). God relates to His people not as lone individuals but as families in untold generations. So it is no surprise to hear the prophets speak about future generations. Isaiah quotes the Lord as saying, “My Spirit, who is on you, and my words that I have put in your mouth will not depart from your mouth, or from the mouths of your children, or from the mouths of their descendants from this time on and forever” (Isaiah 59:21). Ezekiel shares the perspective: “They will live in the land I gave to My servant Jacob, the land where your fathers lived. They and their children and their children’s children will live there forever” (Ezekiel 37:25). Jesus’ response to His disciples is then predictable. When His disciples sought to hinder mothers’ efforts to bring their children to Him, Jesus was “indignant” –literally, ‘livid’– and told His disciples, “Let the little children come to me, and do not hinder them, for the kingdom of God belongs to such as these” (Mark 10:14). What made Him so indignant? He was upset with His disciples because the Lord God had sent His Son into the world to “save His people from their sins” (Matthew 1:21), and “His people” includes –according to Old Testament pattern– the children of the covenant. The little ones whom the mothers were bringing to Jesus were not little Romans or little Moabites, but little Israelites, covenant children all. That’s the reason why Jesus “took the children in His arms, put His hands on them and blessed them” (Mark 10:16). If His Father’s reach in the Old Testament included the children in Israel, the Son’s reach was not allowed to be any less. Peter’s words on the day of Pentecost are consistent with the picture that arises from the Old Testament. It was manifestly the adults of Jerusalem that demanded the crucifixion of Jesus of Nazareth, and equally the mature that recognized their guilt and asked the disciples what they had to do. Peter’s answer is instructive: “Repent and be baptized, every one of you, in the name of Jesus Christ for the forgiveness of your sins. And you will receive the gift of the Holy Spirit” (Acts 2:38). But notice how Peter formulates his incentive to their repenting: for “the promise is for you and your children and for all who are far off – for all whom the Lord our God will call” (vs 39). What did the Jews understand by the word ‘promise’? Steeped as they were in Old Testament thinking, the reference to “the promise” that was for them and their children was plainly the content of God’s covenant with Israel: I will be your God. Notice that Peter does not limit the covenantal promise to the generation standing before him, nor to that generation plus their children at home, but he includes generations still unborn. The generation standing before him needs to repent on grounds that God has made His covenant with them, and needs to repent also on grounds that God has made His covenant with their children after them (including the unborn) – and so those children need God-fearing parents to teach them the Lord’s way. Here again is nothing of the individualism so rife in our modern western society, but instead a deep awareness that God relates to His people in the generations. See further a passage as 1 Corinthians 7:14, and compare Ephesians 1:1 with Ephesians 6:1 for more confirmation of the point. Infant Baptisms in the New Testament? At the end of his visit with Cornelius, Peter asked, “Can anyone keep these people from being baptized…?” Since there were no objections “he ordered that they be baptized in the name of Jesus Christ” (Acts 10:47,48). Who exactly made up the crowd that was baptized? The crowd is described in vs 24 as Cornelius himself and “his relatives and close friends.” Does this include children? At a minimum it certainly does not exclude children. In response to hearing the apostle’s preaching, Lydia came to faith. The Holy Spirit records the event as follows: “The Lord opened her heart to respond to Paul’s message. When she and the members of her household were baptized, she invited us to her home” (Acts 16:14,15). Notice the formulation: the Lord tells us of one believer and of multiple baptisms, all of them within her household. It’s the identical pattern as we discovered with Abraham. Were children baptized with Lydia? The text certainly does not exclude children. On the contrary, we may safely say that if Lydia had children in her household, they too were baptized. After the earthquake that shook the Philippian jail, the rattled jailer fell trembling before Paul and Silas to ask his desperate question: “Sirs, what must I do to be saved?” Their answer: “Believe in the Lord Jesus, and you will be saved – you and your household” (Acts 16:30,31). Notice how the faith of the one man touches his whole household. As a result, “he and all his family were baptized” (Acts 16:33). In our translation the passage adds that “he was filled with joy because he had come to believe in God – he and his whole family” (vs 34). But the Greek isn’t so explicit about “his whole family” having believed. The Greek very much places the onus on the jailer alone, and (as in vs 31) the family benefits from his repentance. Were children baptized with the jailer? The passage allows for only one conclusion: if he had children, they most certainly were baptized too. We recognize in all these passages the Old Testament pattern of God dealing not with individuals but with families – and His approach to the family is determined by the spirituality of the family’s head. As a result we certainly cannot insist that the New Testament knows nothing of infant baptism. Rather, the children are obviously included when these parents were baptized upon their coming to faith. This becomes the more clear when we recognize that the terms rendered in the above passages as “household” or “family” appear elsewhere in Scripture with obvious inclusion of little children. Jacob laments that if the Canaanites attack “I and my household will be destroyed” (Genesis 34:30) – and he’s surely not suggesting that the enemy will spare the little ones in his tents, be they his own (grand)children or the offspring of his servants. Moses reminded Israel that the Lord “sent miraculous signs and wonders … upon Egypt and Pharaoh and his whole household” (Deuteronomy 6:22), and we understand well that the infants of Egypt were as discomfited by the plagues of frogs and lice and darkness as the older of the population. See further Genesis 7:1; 12:17; 18:19; 36:6; 50:7f; Exodus 1:1; Joshua 24:15 and so many more. The term ‘household’ in Scripture certainly includes children. Finally, if it still be insisted that the New Testament records no explicit reference to infant baptism, let the reader recall that the apostles were missionaries engaged in mission work. 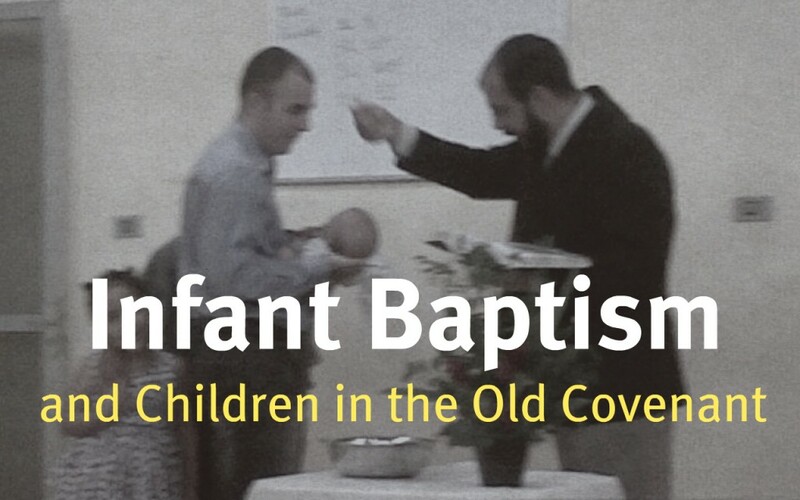 Even today infant baptism on a mission field is relatively uncommon on the simple ground that mission work is directed at adults – and when under God’s blessing the adults come to faith the household is baptized. The conclusion, then, is evident: though there is no explicit mention of an infant being baptized, the New Testament –in line with God’s Old Testament revelation– both knows and requires the baptism of little children. In fact, that’s why infant baptism was standard fare in all churches until the rise of the Anabaptists some 1500 years after Christ’s ascension. Denying infant baptism is actually a relatively new phenomenon….